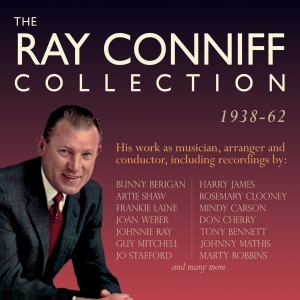 Ray Conniff became one of the biggest stars of easy listening music as a bandleader and conductor during the 1960s and beyond, but his career began in the late’30s as a trombonist with Bunny Berigan, before joining Artie Shaw as trombonist and arranger in the early ‘40s. His career blossomed after he joined Columbia Records, working as an arranger and conductor with a remarkable array of top names over the years, from bandleaders like Harry James to the great singers of the day in Rosemary Clooney, Frankie Laine, Johnny Mathis, Tony Bennett, Johnnie Ray, Marty Robbins and Don Cherry, as well as recording his own work under the name of Jaye Raye. Along the way, he invented his innovative style of integrating a vocal chorus with his orchestral arrangements, which encouraged Columbia’s Mitch Miller to begin what became a hugely successful series of LPs recorded under Conniff’s own name beginning in 1957, which established his trademark sound. This great value 113-track 4-CD set traces the first quarter-century of his career from his recording debut in 1938 through to the early ‘60s. It’s a highly entertaining overview of the work of one of the illustrious names of popular music in the post-war era. 30 Such A Shame Four Voices with Ray Conniff and His Orchestra. 9 When I Get The Notion The Landon Sisters with Jay Raye and His Orchestra. 10 I'm Flipped For You The Landon Sisters with Jay Raye and His Orchestra.